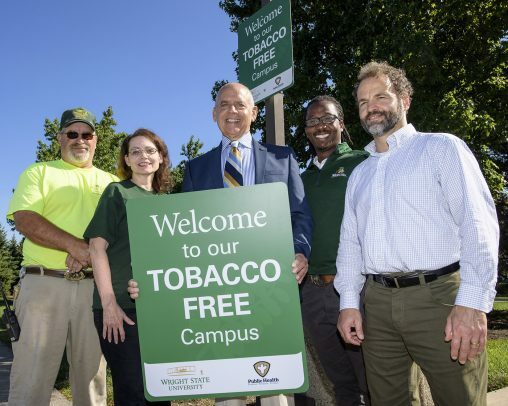 Wright State became a tobacco-free campus on July 1, joining over 1,400 other colleges and universities in the United States that have chosen to become tobacco free. 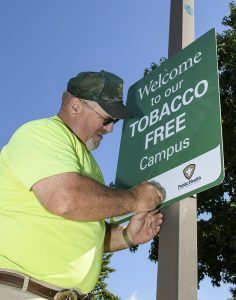 “As a community partner, Public Health has been conducting cessation classes on campus and provided 46 large street signs that welcome everyone to Wright State’s tobacco-free campus,” said Bruce Barcelo, healthy lifestyle supervisor at Public Health – Dayton & Montgomery County and a Wright State alumnus. “We know that college age may be a time of experimentation for students so we want to create a healthy environment for learning,” said Barcelo. According to the Ohio Department of Health, nearly 40 percent of college-aged smokers either started smoking or became regular smokers after they started college. And the 2012 Surgeon General’s Report on Tobacco Use Among Youth and Young Adults stated that progression from occasional to daily smoking almost always occurs by age 26. “The encouraging, hopeful news is that tobacco-free policies like the one Wright State University has implemented are shown to impact a smoker’s willingness to quit,” said Barcelo. And research continues to show that there will be people who quit using tobacco following the implementation of a tobacco-free policy. The increased use of e-cigarettes among youth is of special concern for Barcelo. According to a 2016 report by the Surgeon General, the use of e-cigarettes by youth and young adults has increased at an alarming rate and they are now the most commonly used tobacco product among that age group in the country. Don Zink, Grounds Maintenance lead, installs one of the 46 welcome signs donated by Public Health – Dayton & Montgomery County. The report also stated that many of today’s youth who are using e-cigarettes could become tomorrow’s cigarette smokers. It also warned that it’s critical to take actions to prevent young people from the potential of a lifetime of nicotine addiction. Wright State is committed to assisting smokers and tobacco users who want to quit using tobacco products. That’s why the university has partnered with Public Health and WCORHA WELLScript to continue to offer free tobacco cessation classes for faculty, staff and students at the Dayton and Lake campuses. Newton said many employees and students successfully completed the program during cessation classes offered earlier this year. Wright State began investigating the tobacco initiative five years ago with a task force comprised of faculty, staff and students, as well as Public Health – Dayton & Montgomery County. Barcelo was on the task force from the beginning and has been a valued adviser ever since. After careful review, many surveys and campus discussions, the decision was made to become a tobacco-free campus. All smoking and smokeless tobacco products, as well as e-cigarettes, are prohibited in all Wright State facilities, on university-owned or leased grounds and in university residence halls and apartments. However, nicotine-replacement gum, lozenges and patches, as well as other cessation products approved by the U.S. Food and Drug Administration are permitted. The tobacco-free policy applies to anyone on campus including students, faculty, staff, visitors, consultants, vendors, patients, volunteers and contractor employees. Visit wright.edu/tobaccofree for information about the tobacco-free initiative and additional tobacco cessation resources. Wright State became an independent institution in 1967 and spent the next 50 years growing into a leader in community partnerships. In 2017, it celebrates its 50th anniversary as an independent public university.